Stretching before exercise increases flexibility and elasticity, thus, decreases the chance of injury. People should focus on stretching the muscles that will be activated during the workout. So if it is leg day, the hamstrings, quadriceps, glutes, and calves all need to be stretched. This prevents these muscle groups from tightening up during an exercise. Not only is it essential beforehand, it is just as important if not more to stretch post-session. In fact, if a muscle group has been continually contracted throughout a workout, stretching can help muscles return to their normal length. In addition, it can decrease recovery time and alleviate soreness. It’s important to stay committed, as studies show that flexibility from regular stretching can disappear after 4 weeks of inactivity. • Help muscles resist stress, thereby, prevent muscle and joint strains. • Prepare the body and heart rate for strenuous exercise. • Reduce the severity of painful menstruation (Dysmenorrhea). Body releases endorphins, making people more energetic and relaxed. There is a bone fracture, acute sprain or strain. • The joint is inflamed or infected. • There is pain doing stretches. Stretching determines how far a joint can bend, twist, or reach. When it is done incorrectly, it can be ineffective or dangerous as it can cause tears, instability, and damage to tendons/ligaments. It is controversial still which kind of stretching is beneficial before or after exercises. 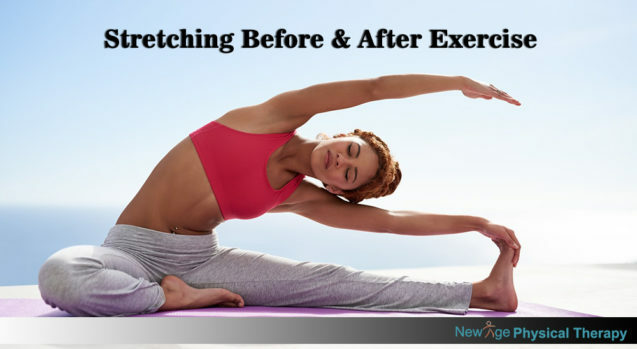 If you are stretching before exercises definitely you need to some kind of warm up exercises before you stretch. Thus, it is important to consult a physical therapist to see which stretching exercises can be incorporated when dealing with an injury or condition.